The Omni Group, producer of many a popular OS X productivity application, has announced the availability of two new iPad apps that let your fingers do the drawing. 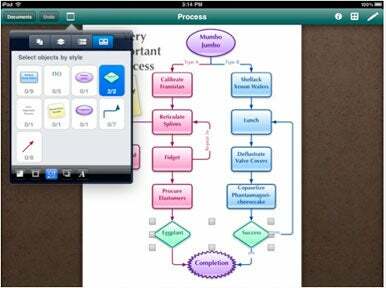 OmniGraffle and OmniGraphSketcher are iPad editions of two of Omni Group’s desktop offerings. The idea behind both mobile apps is to give users tools that allow them to quickly communicate ideas in a collaborative setting—a meeting, a study group, or a brainstorming session. In the case of OmniGraphSketcher for the iPad, that means the ability to draw graphs and charts with your finger. Whipping up a supply-and-demand chart takes only a few seconds on a whiteboard, Omni Group CEO Ken Case explains, but using something like a spreadsheet app, it can be an involved process of plugging in data. “The goal [with OmniGraphSketcher] was to make it as easy to draw a graph on a computing device as it is on a piece of paper,” Case told Macworld. To that end, OmniGraphSketcher was built with a touch interface in mind. Rather than starting from raw data and formulas, you can simply draw graphs with your fingers. As you draw, the app automatically smoothes curves and straightens lines. In a particularly neat implementation, you can fill a portion of a graph by following a line with your finger and then dragging downward. Tapping twice lets you add labels. You can also change the look of everything from the color and type of line to the display text. You can e-mail the finished product (with the option of sending it as a PDF) or save it to the iPad’s Photos app. 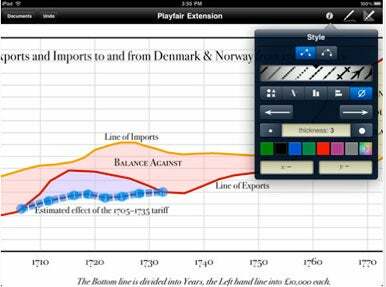 Omni Group touts the iPad version of OmniGraffle as a more general purpose graphing app. With your finger, you can create a diagram, process chart, page layout or graphic design. Some may wonder just how well this will work on the iPad’s interface—fingers are not necessarily instruments of precision—but Case sees the iPad as a natural alternative to a whiteboard or sketchpad. “One of the things that’s nice on a touch device is that you can work directly with the canvas in a way that isn’t possible when you’re using a mouse,” Case said. OmniGraffle makes it possible to quickly sketch out something in a collaborative setting—a meeting, say—and then take that initial sketch and use the app’s built-in tools to adjust shapes, add colors, and otherwise clean up the drawing. As with OmniGraphSketcher, you’re able to e-mail the fruits of your OmniGraffle labors or save them to the Photos app. “You can take the [diagram] back after a meeting and design it for the next stage of development,” Case said. Interestingly, the iPad edition of OmniGraffle adopts some of the features found in the $200 Pro version of the desktop application, such as the ability to share layers between canvases. “It made sense on a touch device,” said Case, adding that Omni Group wanted to avoid having standard and professional editions in the App Store like it does for the desktop version. OmniGraffle for the iPad can open any document created by the desktop version of the application within the limits of the iPad’s available memory. Both Omni Group iPad apps have eye-catching capabilities, but one feature likely to draw the attention of some would-be users are the apps’ price tags. OmniGraphSketcher costs $15, and OmniGraffle sells for $50. Case says his company followed the pricing model Apple used for iWork—a $79 suite on the desktop where the iPad versions of the apps making up the suite cost $10 each. In OmniGraffle’s case, the iPad version sells for about a quarter of what OmniGraffle Professional for the Mac costs (and about two-thirds of OmniGraffle’s Mac customers buy the pro version, Case notes).